It is here! The Ceremonial Start begins tomorrow morning at 10:00 a.m. on 4th Avenue in Anchorage, Alaska. 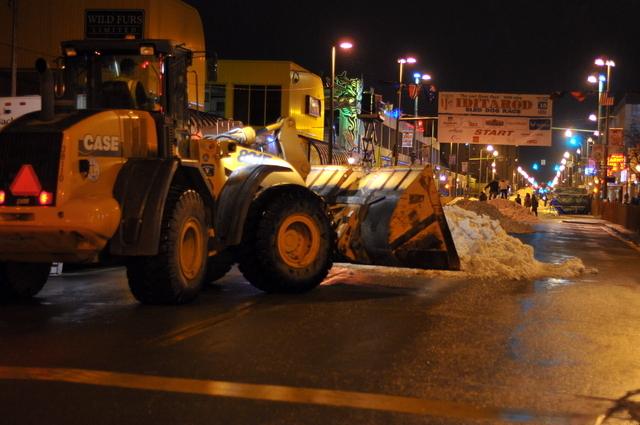 Walking home from dinner tonight the streets are being prepped for the 78 dog teams. The streets are being lined with temporary fences. Tents are being erected for vendors and race officials. 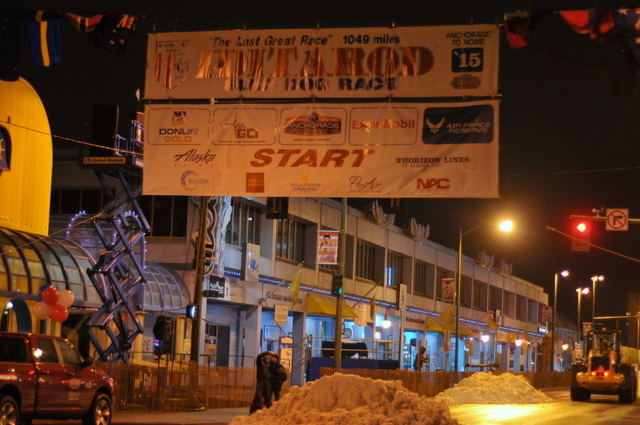 The Iditarod start banner has been draped across the street. Snow is being dumped along the city route. City workers and volunteers are working tirelessly through the night to make sure the Ceremonial Start kickoffs without a flaw. City streets that have been cleared of snow for day-to-day traffic are being transformed into snowy white trails. Truck loads of snow that has been stockpiled throughout the winter is transported and dumped on the streets. End loaders and road graders are then used to level off the mounds of snow. Tomorrow morning when fans step out of hotels and cars they will be greeted by roads converted into a system of dog trails. The Ceremonial Start will begin tomorrow (Saturday) morning at 10:00 a.m. Every two minutes mushers and IditaRiders will begin their journey down the 11-mile trail to the Campbell Airpstrip. Fans will line the trail the entire route. This is an opportunity for fans to cheer their favorite mushers down the trail. Mushers, IditaRiders, and dogs can just relax and enjoy the trail.